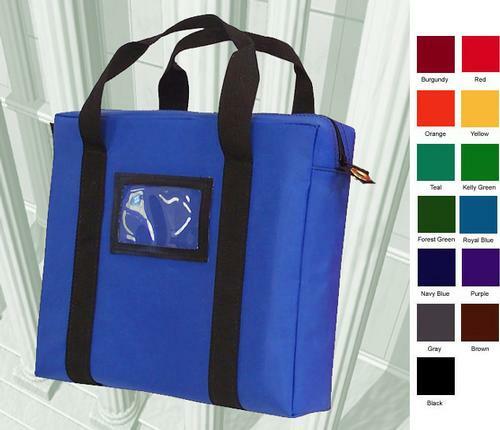 14"W x 11"H x 3"D laminated nylon briefcase-style transit bags. These bags provide extra room for your inter-office or inter-branch communications combined with ease of carrying. The tough, water-repellant materials will provide long years of use; many color choices and colors can be combined for quantity price breaks. Includes framed card holder and webbed handles around bags. Transit bags have nylon zippered closures. One-color imprint charge: $30.00, but FREE on orders of 40 bags or more. For imprinted bags, click on custom imprint button, then forward desired text in a separate e-mail, or attach a digital file, and send to: orders@usbanksupply.com. Production on bags is usually 5 to 10 business days. 14"W x 11"H x 3"D laminated nylon briefcase-style transit bags. These bags provide extra room for your inter-office or inter-branch communications combined with ease of carrying. The tough, water-repellant materials will provide long years of use; many color choices and colors can be combined for quantity price breaks. Includes framed card holder and webbed handles around bags. Nylon zippered closures.